This past Saturday the folks at DSTLD hosted a “Fitting Affair” in order to introduce a number of stylish gals to their new denim line. Founded by co-founders Corey Epstein, Mark Lynn and Steffen Hoffman, DSTLD’s goal is to provide phenomenally fitting, premium jeans at a third of the traditional retail cost. They do this by removing traditional retail impurities—like the middleman and the markup—leaving behind the essential elements of denim: high-quality material, expert tailoring, and the client. Hence the brand’s moniker, which was derived from the word “distill” meaning to purify and refine until only the essential remains. I was thrilled to find out that the company hired one of my favorite designers, Anh Vu. Anh is an incredibly talented and creative designer who has more than 10 years of experience with denim. Not only has Anh assisted the DSTLD team with developing a revolutionary fit technology that emphasizes “body-mapping,” she also came up with a way to create the most comfortable pair of jeans you have ever worn in your life. She won’t reveal her secret but trust me when I say these are the softest pair of jeans that have ever touched your skin. On this beautiful, sunny day a select few lucky ladies were treated to mimosas, a light snack from Heart and Seed, and a private fitting. 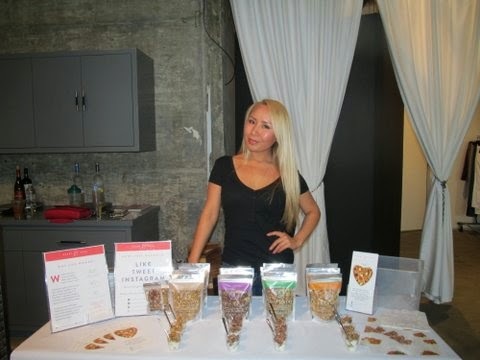 Founded by Tatiana Stepanova, Heart and Seed is an organic superfood granola comprised of five tasty signature blends—Beauty, Energy, Body Guard, Hello Detox, and Peanut Butter and Jealous—that have been carefully formulated towards specific health goals for women. Guests had the opportunity to browse the denim bar and get fitted for a signature pair of jeans. On display was the Made in LA capsule collection featuring the Forever Black Second Skinny, the Forever White Jean, and a trio of summer Tencel jeans in light, medium, and dark gray washes (available in low-rise ankle skinny). A stylist was also on site to assist the fashionistas with completing their looks. After being measured for my fitting Anh suggested I try the Forever Black jegging, which is made from Austrian Beechwood fibers. Being that I am 5’1” I have a difficult time finding jeans that fit well and are the right length, so I was thrilled when I put these on and they fit perfectly and were not too long, not too short, but just right!